But they do not taste good. I thought that you could peel and eat them like an apple – wrong. Just a small bite made me feel like I was having an allergic reaction, but it turns out the un-ripe persimmon has very astringent characteristics that dry out your mouth. And make you feel like you’re having a small stroke. I’m not sure how long it takes a persimmon to ripen until it is “extremely soft and sweet,” but I’m not going to wait around. I’ve got other things to eat, and Thanksgiving is just around the corner. there are two types (at least). Some are fine to eat when hard, like an apple. Others you have to wait until they are soft. 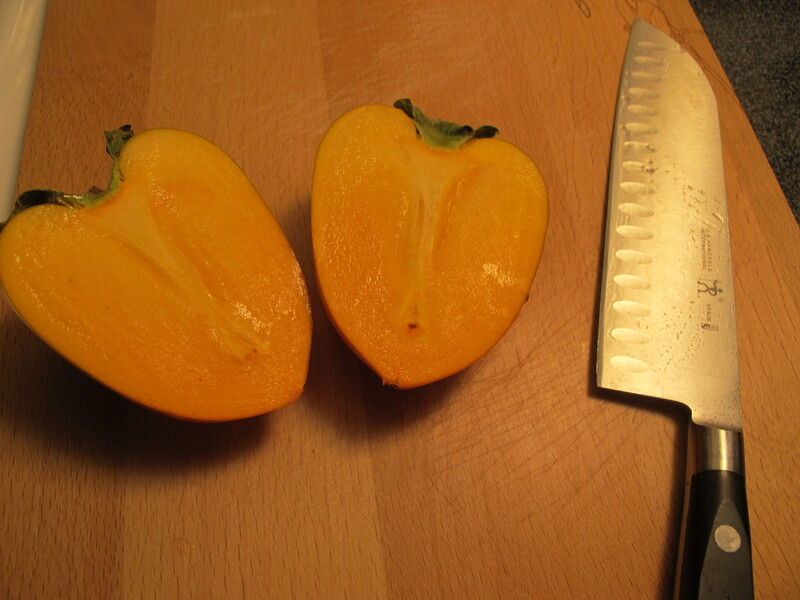 get fuyu persimmons- they are tasty when hard and absolutely delish. We fight over them. Make a trip out to H-Mart, they have a bunch of different varieties. Look for the persimmons labeled fuyu or sharon fruit. They have a shorter squat appearance and will be hard, similar in texture to an apple. Once you try a good one, you’ll be hooked. I accidentally bought the wrong kind of persimmon and you described it PERFECTLY. I was freaking out…I could barely swallow. It was disgusting and I thought I was dying!